At a press conference today in San Francisco, Google announced its second generation Nexus 7, which comes with a number of enhancements. The tablet, which is thinner and lighter than the previous version, has an improved screen with a resolution of 1,920 x 1,200 and a pixel density of 323 PPI. It is equipped with a Qualcomm 1.5GHz quad-core S4 Pro, 2GB of RAM, a 9 hour battery life, and it comes with NFC and Bluetooth 4.0. The iPad mini, released in late 2012, sports less impressive internals in comparison as it has yet to be updated, including a dual-core A5 processor and 512MB of RAM, along with a screen that is 1024 x 768. 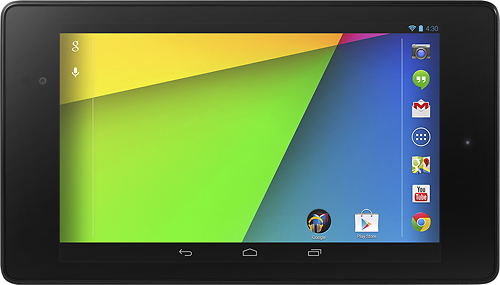 Google has not focused much effort on the camera of the Nexus 7, which is in line with the iPad mini’s 1.2-megapixel front camera and 5-megapixel back camera. The Nexus 7 is also slightly heavier than the mini, with a smaller screen and a smaller profile. In addition to releasing an updated Nexus 7, Google is also aiming at Apple services on several other fronts, taking on both Game Center and AirPlay. The company has launched its Google Play Games app, which is designed to be the Android version of Apple’s Game Center. It works hand in hand with Google Play games services, a feature that lets developers build cloud saving, multiplayer gameplay, and achievements into apps. Chromecast, another feature Google introduced today, is an HDMI accessory that functions similarly to AirPlay, allowing users to mirror content from a tablet, smartphone, or computer. Chromecast works with video, music, and apps like Netflix, and can be used with a number of devices, including iPhones and iPads. Chromecast, which will retail for $35, will be available later today through Best Buy, Amazon, and the Google Play Store. While Google’s Nexus 7 will be available on July 30 with a $230 price tag, there appears to be no iPad mini upgrade on the horizon. Apple has plans to release a redesigned fifth generation iPad with a thinner design and smaller bezels, but it remains unclear when the company will offer a new iPad mini. A recent report from reliable analyst Ming-Chi Kuo suggested that the company might not release an updated mini until March or April of 2014. Wow, that's a thick bezel. Chromecast is what I've wanted for years. 1 simple cheap HDMI plugin that allows any platform to stream to your TV's. As more apps upgrade to support this it will change the living room as we know it today on any platform. Apple REALLY need a Retina Mini now. The chromecast is actually a intriguing product. I'll be picking one up. heck its only $35. Google can't touch Apple. Enough said. I'm not sure that is enough said. Care to explain? Chromecast is a useful device - but it's oONLY a Streamer. Can't do anything else at all. Doesn't do local Streaming - only works by sending the link you are looking at in uTube / netflix whatever to the streamer. Though if you can hook it into plex for the web then it's a great device for the money. Wow. Chromcast. It's as if Google discovered Airplay.